Smoke from regional fires filled the valley this week, and a spokesman from the National Weather Service in Pocatello says the smoke is not likely to sweep out anytime soon. John Keyes, meteorologist, said that the smoke in the area is coming from the 34,000-acre Halstead Fire northwest of Stanley and the Trinity Ridge Fire, a 2,000-acre blaze northwest of Featherville. "The past couple days, with the wind out of the west or northwest, it's been a combination [of the two]," he said Tuesday afternoon. Winds are set to shift toward the south and southwest over the next few days, but Keyes said that this change would not be enough to make the valley smoke-free. "There's some smoke pouring in from the south and west," he said. The main fire that has been heavily smoking is the Cave Canyon Fire, located on the Minidoka Ranger District, he said. According to a Bureau of Land Management press release, that fire was started by lightning on Sunday night and had grown to 4,500 acres by Tuesday morning. No estimates for containment or control have been established. Keyes said the valley might also see smoke from the Flat Top 2 Fire, 8 miles northeast of Kamima. This fire was another lightning start on the night of Sunday, Aug. 5. The fire had grown to 25,000 acres on Tuesday afternoon, though containment was estimated for 8 p.m. on Wednesday, Aug. 8. Keyes added that strong winds would be required to scour out the smoke that has accumulated in the Wood River Valley—winds that either will not be coming soon or will come from the wrong direction, he said. "It's going to be a while," he said. "For the next few days, either winds are not going to be strong enough or will smoke you in from the west." 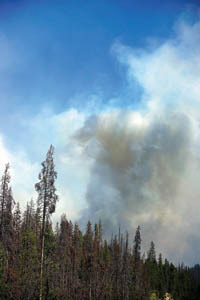 Bill Murphy, fire management officer for the Ketchum Ranger District, said that the southern portion of the Sawtooth National Forest has seen some fires, though the northern end has remained flame-free for the moment. "It's getting drier every day," he said. "The south ends [of the forest] are super-dry, and the north is drying out pretty quick." Fire restrictions on the northern end of the Sawtooth have been expanded, he said. Campfires are no longer allowed except in developed camping grounds, which often charge usage fees. Smoking on National Forest Lands is prohibited unless the smoker is in an enclosed vehicle or building, and chainsaw use is limited to hours between noon and 1 a.m., due to sparks that could fly when chainsaws are being used. "People are still allowed to use camping stoves, they just need to be careful with any ignition source, matches, vehicles—people need to be careful with tall, dry grass," Murphy said. The National Weather Service has issued a red flag fire weather warning for the valley that stretches fromthis afternoon through this evening. Keyes said that warning is based on the potential for lightning-filled storm systems through the region, as well as potential dry, windy weather that could encourage a spark to grow into a blaze. Keyes said there might be some rain associated with today's expected storms, but not enough to make a difference in fire danger. "It will seem like a lot, but it won't wind up being that way," he said. Halstead Fire closures are still in effect, though the fire still hasn't affected Highway 21 from Stanley to Boise, nor has it resulted in the closure of the Boundary Creek Launch Site or the Middle Fork River Corridor. For more information, check http://inciweb.org/unit/46.